Argosy Cafe & Restaurant Logo promotion: beside the Argosy ZK-SAE “Merchant Enterprise”, in Marlborough. 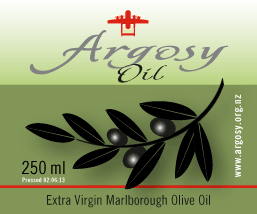 ‘Argosy Olive Oil Label and card, Argosy airplane signage and marketing elements. The Argosy Trust administers the aircraft, ongoing restoration, displays and artifacts. “Renwick School Flies the Argosy” Video 2014 – 3 mins I-Doco Filming and editing. Soundtrack.